Plan. Amaz. Rev. Int. Dir. Amb. Pol. Pub. 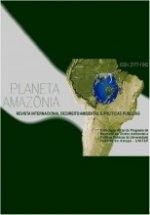 Planeta Amazônia: Revista Internacional de Direito Ambiental e Políticas Públicas (ISSN 2177-1642) is an official publication of the Master's Program in Environmental Law and Public Policy at the Federal University of Amapá - UNIFAP. It publishes original articles on topics involving environmental law and public policy that aims at the continuous search for ecological balance. Because of the interdisciplinary nature of the Graduate Program in Environmental Law and Public Policy Federal University of Amapá, the Journal accepts input from various areas of knowledge, such as law, economics, planning, town planning, environmental sciences , education, linguistics, among others. Publishes original and unpublished articles. It is open to Brazil and foreign collaborations. The Analysis and assessment of the articles by the referees are performed with the anonymity of the authors of their work and reviewers. The deadline for receipt of the articles of contributions is with streaming. Is indexed in several bases of national and international data. Directory of Research Journals Indexing; Elektronische Zeitschriftenbibliothek; Latindex; Livre! ; Qualis Capes; SEER; Sumários.org.